What Olympic athletes also have in common, whether or not they win medals, is passion, desire, ambition, hunger, determination, confidence and grit. They're not afraid to dream big... Why, then, do so many of us limit ourselves, hold ourselves back, restrict ourselves to "modest" goals -- only to look back at our lives and wonder what might have been? I'm not what you would consider a sports junkie by any means, but I do get into the Olympic Games, both winter and summer. I don't know what it is but I always end up watching far more of the coverage than I expect; and I also end up watching events I would never otherwise be interested in like, for example, shot put and archery and snowboarding and curling. As for this year's Rio Games, like millions of others I've been particularly interested in the sprinting. Andre De Grasse has done Canada proud accomplishing, at only 21 years old, what no Canadian Olympic athlete has done before. He won three medals (one silver, two bronze) for sprinting in the same Olympic Games. 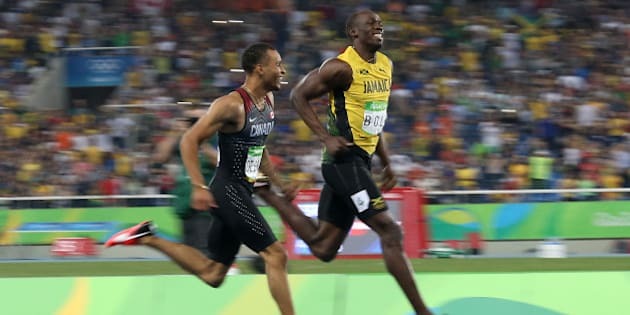 It was Jamaica's Usain Bolt, though, who had us all mesmerized, as he won the "triple triple" -- nine gold medals in three different Olympic Games (Beijing, London and Rio)! But it was while I sat in front of my TV last Friday night watching him glide easily across the last finish line he'll ever cross, with a big smile on his face, leaving all his fellow competitors in the dust, that I had an epiphany, that I realized there is so much more to the Olympics than athletic prowess; and how much it can teach us. "This," I thought to myself, "is about life -- or it should be." No matter where they were born, their nationalities, the colour of their skin, their age, their gender, their sexual preferences, whether they're from wealthy families or impoverished nations, whether they're highly educated or not, each and every one of them makes sacrifices to become Olympic athletes -- financial and otherwise. For instance, when their friends are out partying and living on pizza and beer they're training rigorously, four and five hours a day. Imagine how much better our grades might be if we played less and studied more. Or if we paid that kind of attention to our jobs. What Olympic athletes also have in common, whether or not they win medals, is passion, desire, ambition, hunger, determination, confidence and grit. They're not afraid to dream big and they pursue those dreams like pigs hunting for truffles. Why, then, do so many of us limit ourselves, hold ourselves back, restrict ourselves to "modest" goals -- only to look back at our lives and wonder what might have been? Olympic athletes step up to the plate and "own" their mistakes, learn from them and move on -- never letting them get in the way of "next time." For these elite athletes there is always a next time, always an opportunity to do better. Yet we often fear "failure" when, instead, we should embrace it, take it in stride and turn it into the adrenaline we need to propel us to greater heights in the future. Ryan Lochte and his men's 4x200m freestyle relay team members may have exhibited the worst kind of behaviour, but the rest of the athletes in the Rio Games showed us, time and time again, how it's possible to compete vigorously and win and lose with grace and class. And, through the Russians, this year the whole world found out that eventually cheaters get caught and the penalties are harsh. So what do you think? Does the Olympic spirit and everything it stands for not seem like a winning formula to you? That if we're prepared to make sacrifices and push ourselves beyond our limits we can have the successful and satisfying lives we all crave and deserve. It sure does to me.